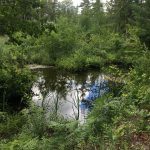 Teaming with life, my little heart shaped pond in the heart of 22 acres near Dye Creek in Mecosta is host to myriad species of reptiles and amphibians, not to mention the many mammals, birds, fish, and invertebrates that inhabit this little slice of heaven. Spring and early summer welcome the emergence of not only dragonflies, green herons, water snakes, wood frogs, and mud minnows, but also herald the arrival from winter dormancy the many turtles that find a haven in wetland areas such as my backyard. On sunny days, when the afternoon breeze is lazily blowing the reeds and grasses, it is easy to spot Painted turtles out basking on fallen logs or the snout of an eastern Snapping turtle coming up for a breath of air. If you’re lucky, you may also spot another, rarer and mostly aquatic relative, the Blanding’s turtle. While Painted turtles and Snappers are abundant and probably our most recognized species in the area, the more secretive and timid turtle, the Blanding’s (Emys blandingii) is harder to spot as it typically likes to dwell in the weedy and shallow areas of marshes and river tributaries. These turtles have the potential to live to reach 80 years and enjoy an omnivorous diet, feeding on frogs, fish, and decaying vegetation. Sadly, it is considered by the Michigan DNR to be threatened and is protected by law as “a special concern species” “due to wetland degradation and road mortality”. (Michigan.gov/DNR) So consider yourself lucky if you happen to come across one these beauties. Almost as easy to identify as the Painted, their shell is typically domelike, very dark to almost black, and smooth. The most telling features for identification are the lovely yellow speckles on the upper shell and its bright yellow neck. The best time to for a chance encounter with the elusive Blanding’s turtle is in early June, as this is when pregnant females characteristically venture out of their comfort zones, drawn to spots far away from the safety of their ponds to lay their clutch of eggs. The importance of any organism in our wetlands, including all species of turtles, goes without saying. Turtles are an excellent example of an animal whose structure and build has not changed in millions of years; they have survived the way they are, making them a unique example of evolutionary success. Using the analogy of J. Whitfield Gibbons, a well-known ecologist and author of the book Keeping All the Pieces: Perspectives on Natural History, we can look at this particular ecosystem as a brick wall with each brick having its own individual significance in the strength of the wall. Losing any species is like taking a brick out the wall, lessening its integrity. If we lose too many species, or take too many bricks out, the wall will collapse. Working to save threatened species is imperative in our mindfulness of the world in which we live. Quite recently, one late afternoon as I was sitting in my living room looking out at the front yard, (my pond is in the back of the house), I happened to notice a rather large turtle making its way with great purpose across the grass toward my driveway. In the moment, I assumed it was a Snapping turtle, as most of my experiences with random turtles of this size out of their typical environs have been with these particular creatures. I immediately grabbed my camera to go capture the moment and as I drew closer, focusing the lens, I was thrilled to discover that it was indeed a Blanding’s turtle! Given the time of year, early June, I guessed that possibly it just might be a mama in search of the right sandy spot to lay perhaps 6-12 soft shelled eggs. To confirm, I gingerly turned her over, pulling her tail out as gently and as fully as I possibly could, to see the location of her cloaca (the genital, intestinal and urinary opening). A male’s cloaca can typically be seen on an extended tail outside of the edge of the plastron, or bottom shell, and a female’s will be further up the tail, much closer to the body, almost hiding. I was giddy to see that she was indeed a female! I spent about a half an hour watching her navigate, swiftly for a turtle, in what seemed random indecisive movements, changing direction, going from grass to dirt driveway (leaving the most unusual tracks!) to grass and back again. Finally, she disappeared into a woodpile just on the edge of the drive and I gave up my amused watch and also disappeared, into the house, to soothe my dogs who knew they were being excluded from some real excitement! Not an hour later, as dusk was nearing, I looked out the window again and saw my shelled friend actually in the process of digging her nest on the very edge of the driveway not far from the wood pile and laying her eggs – a location probably 100 yards from her home in the little heart-shaped pond! Checking on her progress hourly until bedtime, and again in the middle of the night, I quickly realized this was no easy or quick endeavor for her; laying eggs is most certainly a labor of love and a lot of hard work. In the light of the morning, she had disappeared, most likely back to the quiet of the pond to rest after her many hours of effort, leaving almost no telltale sign of what treasure lie beneath the sandy dirt. 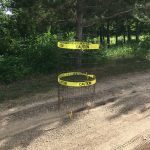 I quickly found a wire cage which had previously served to protect the base of a young apple tree, and carefully set it up around the area and secured it with a couple of tent stakes. 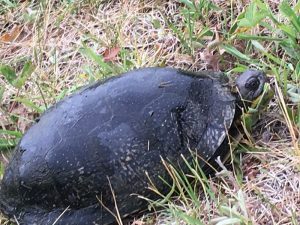 I knew this was imperative, as another reason why these turtles are threatened is that their eggs are quite often a delicacy to many predators, not the least of which are raccoons. I am hoping with all my heart that the nest will remain protected and undisturbed until mid-September, when they will slowly hatch and, if all goes according to plan, the newly emerged young will make their way to my little heart-shaped pond to feed and then begin the preparation process for overwintering. 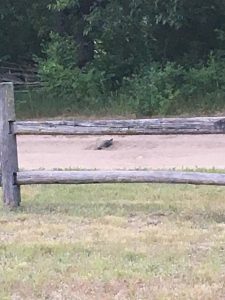 To have been lucky enough to experience firsthand the marvel of a female turtle laying eggs just feet from my home live-time is exceptional and quite possibly a once in a lifetime occurrence. Given that the particular species was a Blanding’s turtle makes it all that much more singular. As stewards of our environment, and more specifically the Muskegon River watershed, it is of the utmost importance that we all are, to some degree, citizen scientists and naturalists in order to ensure the wellbeing and protection of all of the plants and animals which make up this special region of our earth. By keeping our eyes and minds open and well-informed, and by embracing moments in which we can facilitate nature’s course to a more secure end, we and generations to come can continue to enjoy and watch our natural environment thrive. 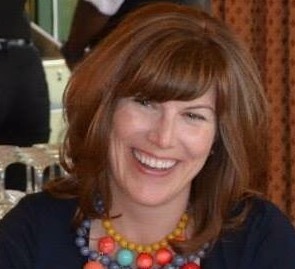 Lorrie Gillingham Murray grew up in Mt. Pleasant and currently teaches Spanish at Central Michigan University. She is the daughter of world renowned herpetologist Dr. James Gillingham and was raised surrounded by reptiles and amphibians of all kinds as well as with an inherent love, awareness and knowledge of the natural world. She has two adult sons in whom she encouraged the value of and curiosity for the flora and fauna of the world and who spent their childhood bringing nature home every day! She lives with her husband Bob, an administrator at Ferris State University, and two dogs in Mecosta. Fun Filled Lessons about Life!